All About Pechuga Mezcal: Meat Infused Agave Spirits - Alcademics Alcademics.com Cocktails, spirits, bars, and bartenders: Alcademics is the study of booze with beverage journalist Camper English. A few years ago (Feb 2014) I wrote a story about pechuga mezcal, one of the most in-depth ones I'd seen at the time. The story was for Details.com, and the website (and magazine) no longer exist. Thinking it's a shame that the story disappeared (the URL now redirects to the front page of GQ's website) I am pasting it here. In anticipation of a new ham-flavored mezcal, our cocktail maven traces the roots of pechuga, the oddest bird in the agave-based spirit family. This March, chef José Andrés' restaurant Oyamel in Washington D.C. will be the first place to debut Del Maguey's new Ibérico, a mezcal made with ham that costs $200 per bottle. The pig parts are a new thing dreamed up by the Spanish chef, but there is a history of putting animals into mezcal in Mexico that dates back a few hundred years before bartenders dabbled with bacon infusions. Most mezcals with meat available in the U.S. are known as "pechuga" mezcals; the word is Spanish for "breast." (Let's get this out of the way: We're not talking about mezcals with "worms" in the bottle, which are added afterward and are not actually worms, but usually arean indicator of a crappy product.) 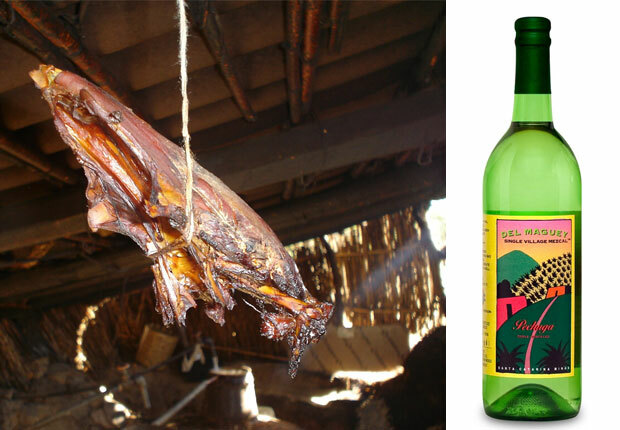 The first pechuga on the U.S. market came from Del Maguey; it is the same as the vegetarian Del Maguey Minero but infused with fruit, rice, and other ingredients and redistilled with a chicken breast hanging from strings inside the still. The technique isn't unique in the spirits world; many gins are made in a similar method called vapor infusion. Just not with livestock. Odder still, there is actually a market for this stuff. Several other brands—like Pierde Almas,Fidencio, Real Minero, Tosba, La Niña del Mezcal, Benesin, and El Jolgorio sell pechuga mezcals, though most use turkey (guajolote) rather than chicken. Pierde Almas also sells a conejo mezcal, which swaps in a rabbit, and I've heard a few mentions of a venison mezcal in Mexico, though it's not available in the U.S..
From left: Chicken breast suspended during distillation; Del Maguey's pechuga bottle. According to the son-in-law of the distiller at Mezcal Vago (which has a corn-infused mezcal called Elote), the neighbors would request a special-occasion treat for events like weddings and baptisms. So the distiller got the idea to take the mezcal he'd already made, infuse it with dried corn from the family farm, and distill it another time. It proved so popular that they began bottling it commercially along with the base mezcal. Del Maguey's version includes, in addition to the hanging chicken breast, an infusion of wild mountain apples and plums, plantains, pineapples, almonds, and uncooked white rice. According to importer Ron Cooper, the chicken balances the fruit. Fidencio's pechuga uses plantains, apples, pineapple, guava, and sometimes quince and pear, says Canadian importer Eric Lorenz. He also notes that Pierde Almas' version uses some combination of those ingredients, plus cloves, star anise, and a bag of rice, and then either turkey breast or rabbit. The fruits and spices, in all likelihood, once helped mask the taste of some lackluster mezcal in the early days of distillation in Mexico. Today, however, most if not all of the pechuga-style mezcals are made from the same mezcal that the importers sell unflavored—so you could try the before- and after iterations in a taste test if you like. Some of these ingredients are seasonally driven. El Jolgorio pechuga is made around the Feast of the Virgen de los Remedios (near September 1), while most others are made later in the year (November). The makers of Fidencio say their product is made specifically during the quince harvest. "Basically, when they had something to celebrate like harvest abundance," Lorenz says, "they pulled out all the stops to do so, including making their usual beverage better for this and other special occasions." Cooper, the founder-importer of Del Maguey and basically the guy who kicked off the whole mezcal renaissance, says the taste of chicken mezcal is quasi-feminine when compared to the more masculine ham version. Other tasters rely on textural descriptions, invoking the words umami and unctuous for these mezcals. "Among the 15 or so pechugas I've tasted, truly the most prominent flavor in all of these is undoubtedly the fruit components," Lorenz admits. When I'm feeling extremely on my game (and when I'm no longer sober), I can indeed detect mild chicken- or turkey-broth hints . . . and I'm pretty sure those are the typical conditions under which everyone else believes they can detect the taste of the meat as well." Perhaps it's easiest to think about these meaty mezcals like the strawberry-rhubarb pie your grandmother bakes from ingredients in her garden that she brings to the family-reunion picnic—a long-standing homemade delicacy for special occasions. But instead of fruit in a pie, it's a carcass in agave juice.